The scrapbuster ideas found in Scrap-Applique Playground are unlike traditional quilts. Instead of putting together quilt blocks, discover a new way to create bright and colorful quilts. You'll learn how easy it is to fuse and patch scraps together, ultimately resulting in a wonderful new quilt creation. These whimsical applique designs are charming and easy to make. The reader can choose between eight different and simple applique quilt patterns. The designs range in terms of skill level so even a novice sewist can enjoy these wonderful ideas. Creating a pretty, scrappy quilt is as easy as following the step-by-step instructions. 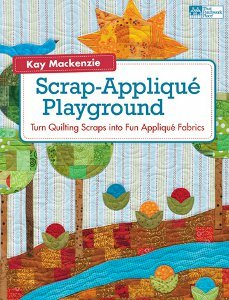 Unlike other scrap quilting books, Scrap-Applique Playground delivers clear directions in an approachable way. Readers are left feeling inspired to give applique a try. Mackenzie leads the reader through important methods like the fusible interfacing and bias-covered edges. The colorful graphics also help guide readers along the way. Sewists and quilters alike will love these beautiful ideas; especially those with stashes full of scraps just waiting to be used. Let Scrap-Applique Playground show you how put your scraps to good use by creating lovely quilts you'll love. Enter to win The Marilyn Dress pattern! Enter to win the Sewing Made Simple Giveaway!